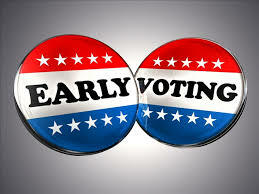 Early Voting is now available from the 40th day prior to an election through the day before an election. It effectively replaces what was previously known as in person absentee voting. Any registered voter in DeKalb County may choose to vote early. A voter is not required to show an ID to vote early. Check your Voter Registration Status here, where you will also be able to find your polling place and a sample ballot (when available). We have several Early Voting sites throughout DeKalb County to conveniently serve all voters. To view the locations, dates and times of Early voting, see the Voting Schedule above (when available).